Material Resources Planning [MRP] system is an automated system for scheduling the purchase of materials and the production process. It takes as input the current on-hand and in-transit inventory record for each component of a product as well as the amount of labor required to build it and the bill of materials that lists the components of each item to be produced. 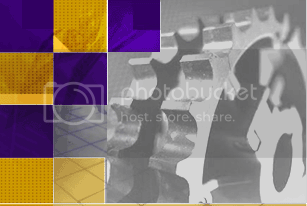 Its output is a production and staffing schedule that takes into account all constraints and produces purchase orders for any required materials. Given the automated nature of the system, it is critical that all information entered into it be as accurate as possible. Consequently, virtually all controls associated with MRP are concerned with maintaining the highest possible degree of record accuracy. This post gives the best possible control that could be implemented on an MRP II system. At the last section of this post, I provide MRP II system procedure that integrates many of the controls into the operation of the MRP II system. Enjoy! Maintain 95 percent inventory record accuracy. For the MRP logic to function properly, not only must the inventory quantity be accurate, but the record of its location, unit of measure, part number, and description must be accurate. A generally accepted minimum level of record accuracy is 95 percent. If a lower level of accuracy is maintained, the MRP logic will yield incorrect results. Maintain 95 percent labor routing record accuracy. As was the case for inventory record accuracy, labor routing records must also be sufficiently accurate to result in accurate workload scheduling throughout the production process. Maintain 98 percent bill of material record accuracy. The bills of material are critical for determining the value of inventory as it moves through the work-in-process stages of production and eventually arrives in the finished goods area, since these bills itemize every possible component that comprises each product. These records should be compared regularly to actual product components to verify that they are correct, and their accuracy should be tracked. Notify MRP system of under/over receipts. It is very likely that suppliers will not ship precisely the amount ordered, either because some portion of an order is rejected for quality reasons or simply due to slight miscounts in the quantities delivered. In either case, the MRP system will not function properly unless it is aware of the exact amount of usable inventory that has been received, which calls for notification by the receiving staff of receiving variances. Require approval to sign out other than pick list quantities. When the production staff asks for additional quantities of a component from the warehouse, this is a strong indicator that the bill of materials used to originally pick the goods is incorrect, probably listing too low a quantity. To correct the bill of materials, carefully document all excess issuances and forward them to the engineering department for examination. Investigate items returned to warehouse. When picked items are returned to the warehouse, this is a strong indicator that the bill of materials used to pick the goods is incorrect, probably listing too high a quantity. A good control is to assign the investigation of all returned items to the engineers who originally constructed the bill of materials, so they can determine the problem and correct the bill of materials record. Notify MRP system of scrap/rework variances. The production process inevitably yields a certain amount of scrap or products that must be reworked. If not reported back to the MRP system, it will assume that a certain quantity of finished goods have been completed when in fact additional production must be scheduled. Consequently, it is critical to enter scrap and rework quantities into the MRP system as soon as they occur. Immediately review all action/exception messages. The MRP system will generate action/exception messages involving problems that will interfere with the production process. A monitoring system should be in place to track how rapidly the production planners respond to these messages. Review the production area for excess inventory. The production staff may not want to spend the time returning excess inventory to the warehouse and instead may let it pile up on the shop floor. By conducting a periodic sweep of the production area for these items and returning them to the warehouse, the engineering staff will have evidence of possible bill of materials problems, which it should fix. Restrict access to the inventory item master file. The ordering subroutine within the MRP system can be severely disrupted if the unit of measure field within the inventory item master file is altered. To avoid this, always tightly restrict access to the inventory item master file. Review excess usage report. The MRP II system is designed to calculate how much material is needed for a specific job. 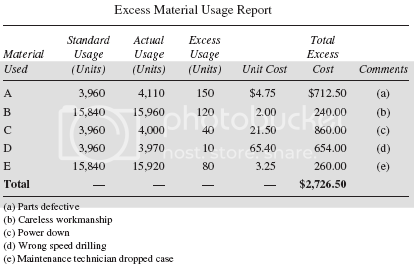 By linking this information to actual materials usage data on each job, it is possible to calculate the amount of excess materials usage by job, as shown in below exhibit. This is a valuable control, since it can be used to improve ongoing operations and to increase the accuracy of the bill of materials. Upon receipt of a customer order, enter the order in the MRP II system. If the order is for finished goods, inform the customer of the expected shipment date. If the order requires production to be completed, inform the customer that he/she will be contacted shortly regarding the expected shipment date. Review all newly entered customer orders, and slot them into the unfrozen portion of the production schedule. Run the MRP II logic, and revise the production schedule based on the presence of warning messages for too little production capacity or inventory. Continue revising the production schedule until all warning messages have been eliminated. Review the projected workloads report, and verify that a sufficient amount of downtime has been scheduled for each work center for routine maintenance. Review the production load on all bottleneck operations to be certain that they can handle the needed load. If not, arrange to shift production work elsewhere or adjust the production schedule and process the MRP II logic again. Review the list of proposed purchase orders issued by the MRP II system for raw materials requirements. If the proposed quantity to be ordered appears excessive, verify the usage requirements, on-hand balance, and any changes to the unit of measure field in the item master record. Correct any errors and process the MRP II logic again. If the purchase orders are acceptable, release them to suppliers and verify receipt. Inform the order entry staff that they can contact customers regarding preliminary estimated shipping dates. Review the labor requirements by work center report, and verify with the human resources department that a sufficient number of workers will be available to operate machinery. Arrange for overtime labor, and schedule specific staff to all shifts. Upon receipt of inventory, call up the purchase order number in the computer at the receiving dock to determine the quantity ordered. Inspect the received item for quality problems, and verify that the received quantity matches the ordered quantity. Log the quantity of usable inventory received into the MRP II system. Contact the supplier about all items not meeting quality standards, obtain an RMA number, and return these items to the supplier. Print the pick list for all jobs scheduled for production during the next work shift. Assign each pick list to a warehouse staff person, who picks items that are listed on the pick list from stock, and check off completed picks on the report. Upon completion of a pick sequence, record the picked quantities in the MRP II system. Notify the production scheduler and materials manager if there were not sufficient quantities on hand to pick all required items completely. Store all picked items for a specific job in a separate bin, and attach the pick list to the bin. Highlight on the pick list all incomplete picks. When needed, move the storage bin to the production area. In the MRP II system, log the picked items out of the warehouse and transfer them to the production location. If the production staff requests additional components for a job, record in the MRP II system the quantity requested and the job number. Also e-mail this information to the product engineering staff, for review of errors in the bill of materials. If the production staff returns excess parts to the warehouse, record the returned quantities and related job number in the MRP II system. Also e-mail this information to the product engineering staff, for review of errors in the bill of materials. Whenever scrap or rework occurs, put it into a scrap/rework bin, complete a two-part scrap/rework form that itemizes the component and quantity, attach one copy to the bin, and place the other copy in the workstation out box. At the end of each shift, collect all completed scrap/rework forms from the workstation out boxes and enter them in the MRP II system. At the end of each shift, tour the production area and collect all scrap that has not been placed in scrap/rework bins. Complete scrap/rework forms for these items, store them in bins, and record the forms in the MRP II system. Upon completion of the production process, return all finished goods to the warehouse for storage. At the warehouse gate, count and tag all inventory and record it in the MRP II system. Store the finished goods in bins within the warehouse, and record the bin locations in the MRP II system. At the end of each shift, tour the production area and collect all finished goods that have not been delivered to the warehouse. Verify with the production manager that these items can be designated as finished goods, and bring them to the warehouse for storage. At the warehouse gate, count and tag the finished goods inventory and record it in the MRP II system. Store the finished goods in bins within the warehouse, and record the bin locations in the MRP II system.